Searching for a new skateboard for your kid? Altered Fantom 1.0 is where your search should last. As riding on it is much easier than a standard skateboard, it is a perfect buy for your kid. This product from a vintage brand, ‘Altered’, has reached the last marking on the scale of success. It has imprinted such a trustworthy image in the hearts of its users that they can only relax and boast about this incredible possession. This skateboard has got the tendency to fulfil all those awaited skating desires of a beginner. Is Altered Fantom 1.0 Safe? Is Altered Fantom 1.0 Worth the Cost? The attractive and fluent design makes this product a class apart. This 30 x 10.5 x 7 inches product weighs 20.26 pounds and can support weights up to 120 pounds. The deck is crafted out of 7-ply rock-hard maple wood, leading to toughness and ultimately, making it durable. A kick tail is provided and the deck’s surface is made concave so that a better control is achieved. 82 A poured polyurethane wheels of dimensions 80 x 50 mm compiles perfectly with the lucid design of the deck. The design of the wireless remote is an interesting one as it comes in the shape of a pistol. A trigger style button controls the acceleration. Specifically designed for kids, it uses patented torsion truck to make the handling easy. These trucks make the skateboard accurate at turns and the effort that the user needs to put in, is kept minimal. Slight mistakes that kids generally tend to make at turns, goes unconsidered and there is no loss in stability. 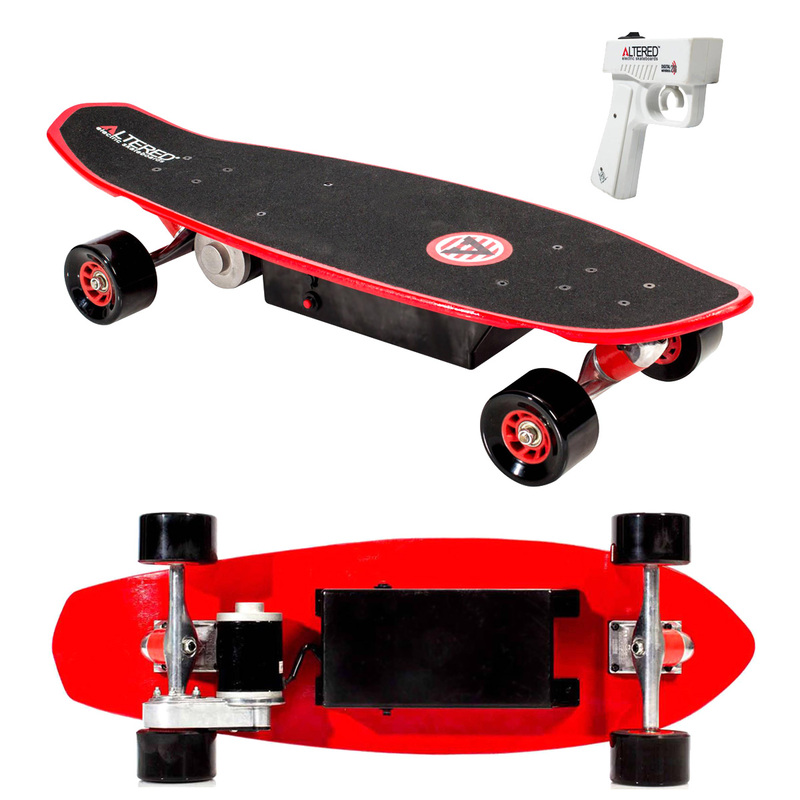 The skateboard is powered by a 100-watt electric motor combined with a smooth functioning belt drive system. This combination results in a more effective and uniform power distribution. The belt drive never gets over-heated and functions quietly. It has got a decent maximum speed of 10 miles per hour and can withstand 40 minutes of continuous riding, in one full charge. However, there is no specified range. Basically, the status of the battery is depicted by the riding time. Once fully charged, you can continuously ride on it for 40 minutes without any reluctance from the system. Easy to operate wireless remote control is provided which controls both the acceleration and the braking of the board. A 12-volt and 7-amp rechargeable battery system is required, which consumes a charging time of approximately 8-10 hours. This product has been designed to keep the safety factor high as it is recommended mainly for kids. The concave shape of the deck helps you to rest both your feet firmly and improves control during ride. The remote is adjusted with grips so that you don’t lose the touch and acceleration and brakes are applied in adequate amount. The chance of wheel bite and loss of stability at turns is reduced to nil by the Exkate T2 Torsion Trucks. The electrical system and the battery is of high quality and not subjected to any kind of failures which can pose a threat to the safety of the rider. The braking system is very responsive and reliable. It doesn’t accelerate to very high speeds because at such high speeds, the controlling gets a little difficult. This electric skateboard is recommended for those who are 8 years and older. In its official website, it comes in USD $ 199. No matter from where you buy it, this price structure is not only affordable but also reasonable. In fact, this is a compelling price as you barely want to miss an opportunity of buying an electric skateboard from a trusted brand, at such low price.